Heat 12-inch skillet over medium heat; add beef and onion. Cook until beef is no longer pink, crumbling beef as it cooks; drain. Stir in rice, broth, and onion soup mix. Heat to boiling; reduce heat to simmering. Cover and cook about 15 minutes, stirring halfway through, until rice is tender. Remove from heat; stir in cheese. Cover; let stand about 2 minutes or until melted. 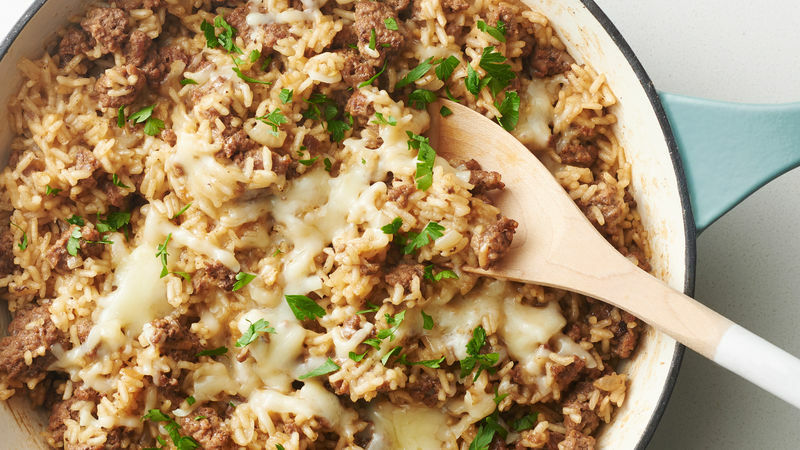 Swap in mozzarella cheese for the Gruyère, if that’s what you have on hand!